Are you ready for the best breakthrough technology in skin care for 2018? This advanced anti-ageing therapy device is an innovative, highly effective 3-in-1 multifunctional tool that can be used on your face, neck and hands. 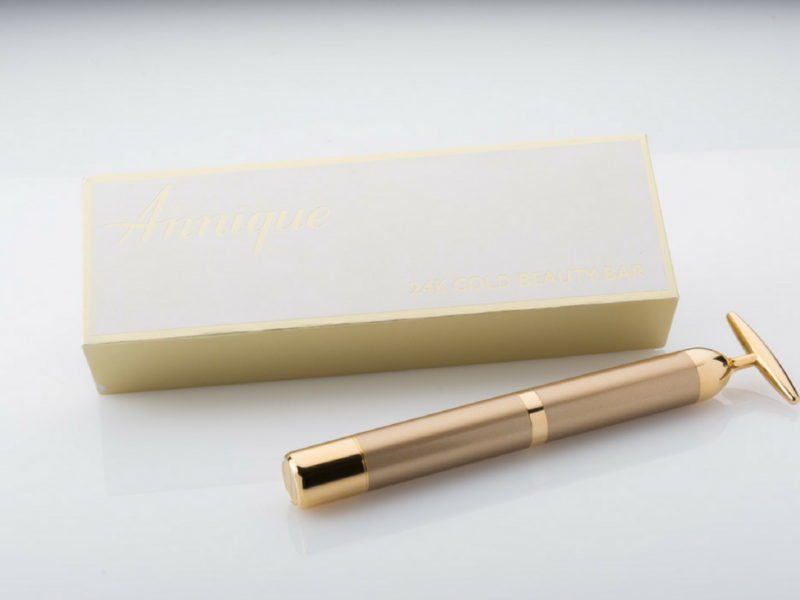 By using the Annique 24K Gold Beauty Bar for a minimum of 2-3 minutes per day it can help to reveal more youthful and energised skin, resulting in a non-invasive facelift and anti-ageing treatment. The 24K Gold Beauty Bar operates by making use of high-frequency vibration at 6000 times a minute. This gives your facial and neck muscles the optimal stimulation, resulting in a lifting and firming effect. It can also help with the optimal absorption of your favourite Annique skin care products. The 24K Gold Beauty Bar has a T-shaped treatment head that has been plated with 99.9% 24K gold. The high-frequency vibration massage, together with the emitted gold ions helps promote lymphatic circulation, increases protein synthesis and assists with the optimal absorption of your Annique treatments due to the ion exchange. It also helps eliminate toxins from the skin. Eliminating excess toxins from the skin helps reduce pimples, blackheads and dark circles. The 99.9% gold plated surface of the treatment head releases microcurrents that can help activate cell activity and enhance cell protein synthesis which aids in the optimal absorption of your skin care products. It also helps to tighten facial muscles, reduce wrinkles, improve circulation in the skin and stimulate collagen production. This helps tighten sagging skin, which in turn gives a contoured effect on the face and neck. The 24K Gold Beauty Bar releases negative ions into the dermis of the skin, helping to reduce free-radicals, promote blood circulation, accelerate cell metabolism and brighten skin. How do I use the new Annique 24K Gold Beauty Bar? Start by turning the base of the 24K Gold Beauty Bar in a clockwise direction.You will feel the device vibrate; the further you turn the device the more intense the device will vibrate. Start at the centre of your face moving upwards and outwards towards your ear. When treating your forehead start above your eyebrows and move in an upward direction. On the neck area start at your collarbone and move in an upward direction. 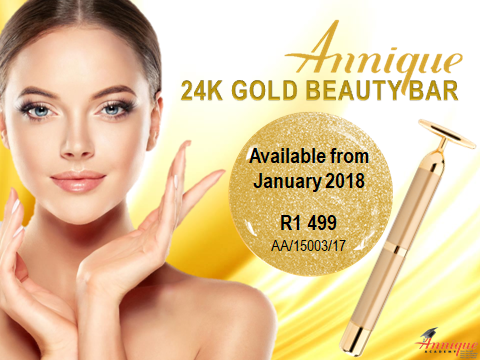 Annique 24K Gold Beauty Bar is available for purchase from January 2018.